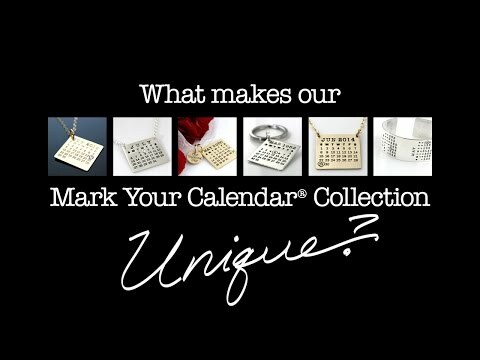 The original hand stamped calendar necklace…what a great way to commemorate a special day. Perfect for a wedding, anniversary, birthday, graduation, sobriety date...any day you want to honor and celebrate! This 22 gauge, approximately 1" gold-filled rectangle can be hand stamped with ANY month from ANY year (past, present or future), and then one day will be highlighted with an oval or a heart AROUND the date, or with a genuine Swarovski crystal OVER the date. Because of our unique process and design, the month and day shown on your piece will fall just as they did on the calendar that year. This 14k/20k double-clad sheet features a gold layer on both sides and has a core of 90% copper/10% zinc. These calendars are not gold plated (see more information below). Your calendar comes with a brushed or polished finish and hangs from a 2.7mm gold-filled cable chain up to 36" long. See ordering options. Finish: Your gold filled Mark Your Calendar necklace can have a polished [first two images] or brushed finish [last three images]. Please see ordering options. Stamping on the back: We can stamp up to 18 characters (no more than 8 characters in one line) on the back of your calendar, but it will require upgrading to a thicker, 18 gauge gold-filled sheet for an add'l $18. Please note that if adding stamping on the back, your piece will be given a brushed finish. See ordering options. Stamping month only, no year: We can create your calendar without a year, if you'd prefer. When ordering, enter the year you'd like the calendar to represent, and then use the 'Special Instructions' to let us know you don't want the year stamped. Gold Filled vs. Gold Plated: Our calendars are made from high quality 14k/20k double clad sheet with a gold layer on both sides. Gold Filled: Also known as "rolled gold" or "rolled gold plate", gold filled is composed of a solid layer of gold bonded with heat and pressure to a base metal such as brass. Some high quality gold-filled pieces have the same appearance as 14 karat (58%) gold. In the USA the quality of gold filled is defined by the Federal Trade Commission. If the gold layer is 10 kt fineness the minimum layer of karat gold in an item stamped GF must equal at least 1/10 the weight of the total item. If the gold layer is 12 kt or higher the minimum layer of karat gold in an item stamped GF must equal at least 1/20 the weight of the total item. Gold Plated: Gold plating is a method of depositing a thin layer of gold onto the surface of another metal, most often copper or silver (to make silver-gilt), by chemical or electrochemical plating. PLEASE NOTE: These calendars are crafted by hand, not mass produced or cast. The size of the rectangle will vary depending on the number of weeks in your selected month. Ordered a necklace as an anniversary gift. Website was easy to navigate and choices were easy to select, allowing me to choose my date, crystal colour, metal, chain length, type of catch and if and what I'd like engraved on the reverse. Received the necklace to the UK promptly and well packaged. It's extremely well made and well stamped, looking even and defined. It's received loads of compliments and looks really unique. It can be dressed up or down and the engraving on the back makes it that little bit more personal. Communication through Punky Jane was second to none and I knew that my custom was important. I was informed through out of the process and it's dispatch. I wouldn't hesitate to recommend this product.